Join us at NATO’s London HQ on Tuesday, April 2nd at 11am! CND has long-campaigned against NATO, a nuclear-armed military alliance, which celebrates its 70th birthday this April. Far from promoting security, NATO is a destabilising global force. Its war of aggression in Afghanistan has killed tens of thousands and left that country fragmented: the ripples of which are being felt across the region. Through its insatiable expansion into eastern Europe, NATO has contributed to heightening tensions around Russia and Ukraine, and risks provoking a new Cold War. As a nuclear alliance which has repeatedly rejected a “No First Use” policy, NATO has shown itself for what it is: an interventionist, expansionist, military club which favours threats over diplomacy. And as NATO marks its 70th anniversary this year, CND will protest to challenge this aggressive alliance which makes all of us less safe. Linking with anti-NATO protests internationally, CND will be at NATO’s Allied Maritime Command in Northwood. Join us as we hand in a letter to the nuclear-armed alliance. 2019 will see two NATO summits: foreign ministers will gather in Washington in April for the actual anniversary of NATO’s founding; and heads of state will meet in London in December. 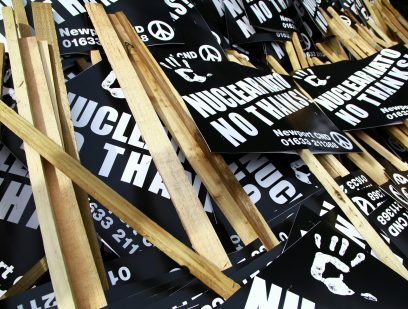 As President Trump is likely to be present, the London NATO summit will be a crucial opportunity for our movement to not only protest NATO, but also to oppose Trump’s nuclear warmongering. We hope you can join us for this event as well.